In reality, I knew Doug bluebirded for me. Doug setting up our bluebird trail at a closed landfill. Doug installing more boxes on a cold February day. The expression is for effect - drama so I would be sure to appreciate his efforts. 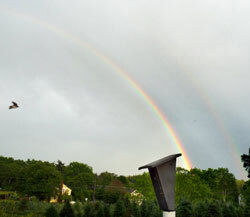 We saw two double rainbows that first week after the news. This one seems to be atop of the boxes we got from Dave Ahlgren. A tree swallow is soaring by on the left side of the frame. He mounted that first birdhouse improperly, on a broken golf club (there were a lot of broken things around Doug) duct-taped to a fencepost. We didn't have a clue what we were doing back then. My home office upstairs looked down over the backyard and the box. The very first winter that I spent in Woodstock, I saw an Eastern Bluebird by the box! My first thought was to call Doug so he could see it too. After that flash of blue, I was hooked. Doug and my sister once asked me why people get so goopy over bluebirds. I wrote an article about it for them. I think Doug got a bit infected too. He would often call me outside to see the first migrants in February or a flock in the winter. While I was away on work travel, he kept our feeders stocked with mealworms for the backyard favorite blues. He did the messy part of homemade suet mixing. He learned to tell a House Wren from a Carolina Wren. He set and dragged my House Sparrow traps around. (House Sparrows are not native. They attack and kill bluebirds.) If he put a trap out himself and caught a male, he made sure that he got a "reward." When we caught some, he did the terminator thing for me before we delivered them to local raptor recovery center. He patiently listened to endless bluebird blather. 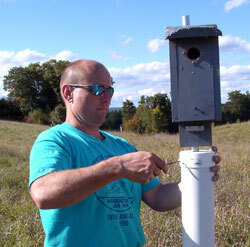 By 2010, we were up to almost 100 boxes on bluebird trails throughout town, including some abandoned boxes that we adopted and Doug repaired. Our goal was to fill the skies of the Quiet Corner with blue. But I wanted to be with him as much as possible - away from the housework, sharing the outdoors together. I knew that life could be short. We had already spent too much time apart because of my early inability to make a commitment (he waited for me for eight years before I was ready to marry) and my job. I also relied heavily on his handyman skills. 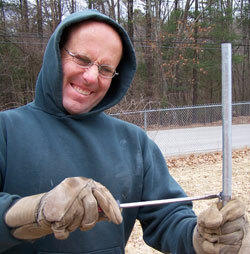 I can't swing a maul, and am useless with tools. Doug could fix just about anything. So, I usually dragged him along with me. Generally, he was pretty accommodating. We would laugh, chat, and do errands along the way. We often enjoyed a little snack or picnic, complete with tasty beverage, in the park or up on the closed landfill where we maintained boxes. We also went to a number of bluebird conferences together. We combined those trips with other adventures. San Antonio, TX - North American Bluebird Society (NABS 2006). We got to meet a "virtual friends" I had emailed with for help about bluebirding, including some of my personal bluebirding heroes. Doug thought the best part was flying first class. (I had racked up quite a few frequent flyer miles traveling for work.) He was awed that we were allowed to start drinking while still on the tarmac. On the way there, we put together a slide show game called "Bluepardy" (a variation of Jeopardy with bluebirding questions.) Doug played the game show host (he was a hilarious ham.) He dubbed me Vanna Blue. I also gave a talk on House Sparrow control that Doug helped me develop. I learned on a field trip that Doug got sick on buses (we had never been on one together). We walked the riverwalk and toured old houses in the downtown historic district. We celebrated my 50th birthday there. Doug gave me a beautiful blue topaz necklace. He picked because it was blue, like bluebirds. 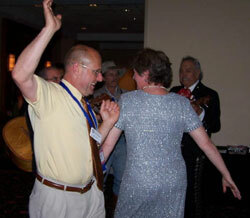 Pennsylvania Bluebird Society annual meeting in 2007. We were invited to do a rerun of Bluepardy. Doug got scared when a (verbal) fight broke out over one of the answers. He never understood why people got so crazed over certain bluebirding topics. Kearny Nebraska in 2006. We decided to go at the last minute after hearing that I would be receiving the John and Nora Lane award from NABS for outstanding contributions to bluebird conservation (for my bluebirding website, Sialis.org. And no, it's not named for the erectile dysfunction drug - sialis is part of the scientific name for the Eastern Bluebird - Sialia sialis.) The flight was expensive, but Doug said we couldn't miss it. We got to see hoardes of migrating Sand Hill cranes. Pennsylvania (NABS 2009). After the conference, we headed off to camp in West Virginia - our last annual anniversary trip. We had planned to spend the whole time exploring PA, but got kicked out of a campground because we had our indoor cat with us. During those conferences, others didn't get a chance to be with him much because I usually hogged him. I could never get enough time with him. He is the only person I have ever known that I never grew tired of. Sometimes I did go out on the trails by myself, especially in the spring and summer of 2010, in order to lighten Doug's load. But it was always more fun to bluebird with him. He was incredibly supportive. He cheered me up many times when things went wrong. On occasion, he did trudge, especially after he went on blood pressure medication, which made him feel rotten. I teased him that he needed more "spring in his sproing" while we were out and about. He usually complied. On July 8, 2010, Doug died while running during lunch. His heart of gold stopped suddenly, possibly due to a malignant arrhythmia. He and I travelled together one last time in the hearse on the way to the crematorium. I did not want him to go alone. The kind funeral director offered to drive us by one of our trails. There is a bluebird I call Brave Blue. This particular female always sits tightly on her eggs and young while I open the box. She is probably protecting her offspring from House Sparrows that abound in that area. Her photo (one of my all time favorites) graces the home page of my bluebird conservation website. That day, Brave Blue flew straight and true, right in front of the hearse as we passed by her box. After losing Doug, I considered abandoning my trails. But I realized that would be irresponsible. It would also mean giving up on something we had built together. Plus I knew I would miss it. Doug told me once that what he liked best about bluebirding was the look on my face when I opened a box and found a good surprise inside. He knew how much joy bluebirding brought me. He did it all for me because he loved me. He was my hero. I'm glad I never took his help, or him, for granted. May all your blues be birds. You can set up a nestbox/donate one in memory of your loved one. Read more. Welcome to Pennsylvania - Now Get Out! The Sun Will Come Up Tomorrow (video clip of Doug singing badly). I only have a few videos of Doug - most are of nestbox contents. This particular clip is quintessential Doug, although it shows a side of him not everyone was lucky enough to see. I think this "performance" was done when I was bummed because I had lost a whole clutch of bluebird eggs (just about to hatch) to a House Wren attack. He was trying to cheer me up. Maybe it will bring you cheer. Crank up the volume. Read more about the EES Fund. Woodstock Historical Society - PO Box 65, Woodstock CT 06281. Funds were used to create and maintain the Z Rock & Rain Garden.